Click to enlarge. Camera not included. The Cross Fire is a unique kit as it is the Single Action kit and Striker kit combined. The Cross Fire uses the expandable DSLR baseplate so this kit can easily be upgraded from a full shoulder mounted system like the Fast Draw. 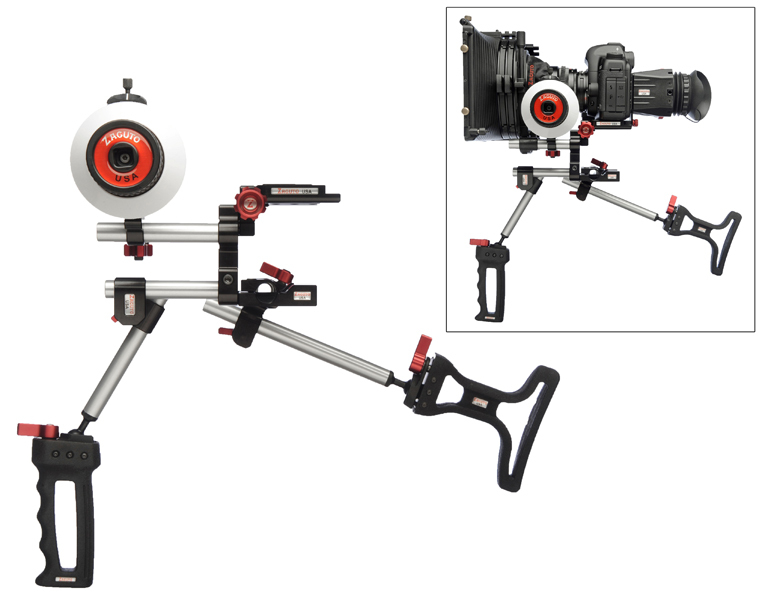 This kit works on any DSLR camera with or without battery grips as it is infinitely adjustable in height. The baseplate attaches to your tripod plate using the standard tripod plate screws, (2) Â¼ 20” and (1) 3/8 16”. Your camera can also be quickly released from the rig by turning the red knob then pulling up on your camera. The camera quick release plate stays mounted to your camera so you can quickly switch between using the camera as part of a rig or on its own. You can easily add the optional Z-Finder Pro, DSLR optical viewfinder, by attaching the Z-Finder Mounting Frame (included with the Z-Finder Pro) to the camera quick release plate using two thumb screws. The .8 pitch Zipgear Universal fits one lens by cutting the strand to fit your lens and connecting the strand together by using the included housing and allen key. The follow focus slides on to the rods and the follow focus gear makes contact with the Zipgear allowing you to pull focus. If you require the use of other lenses with the follow focus, you must purchase additional ZipGears for each lens. “I loved how lightweight the unit was. It’s very well constructed and super durable. The parts are all custom machined and constructed of high strength but lightweight aluminum. The gunstock style point of contact supports the rig against your body. The grip has a clever design that allows the user to quickly flip a lock, move into a position and then quickly re-lock. There are endless possibilities as to how the Crossfire can be configured. I really liked the gunstock and grip.